Anyone who has read my book or seen one of my pen-making demonstrations will know that I am not an enthusiast of small 'pen-making' type sets of tools so when these new Hamlet 'Compac' tools from The ToolPost arrived for testing, I was not expecting to be impressed. I was wrong. These are not the usual miniature tools but seriously reduced length versions of full-size tools. They are specifically designed to make turning easier on smaller lathes where the reduced swing and length between centres can make access with long-handled tools difficult. They allow the turner to more easily attain the correct positioning of the cutting edge and handle movement when working within the constraints of a small machine, thus making it easier to exercise good practice and better tool control. The problems frequently encountered with full-size tools, such as being prevented from achieving the correct presentation of the bevel to the work by the proximity of the tailstock or the lathe bed, are almost completely eliminated. Consisting of a 12mm spindle roughing gouge, 10mm spindle gouge, 10mm bowl gouge, 1.5mm parting tool, 12mm rolled edge skew chisel and a 25mm bowl scraper, every tool in the set feels as though it has been designed for the job in hand and the balance is excellent with handle length proportionate to the body of the tool. If you have a small lathe, then you will appreciate the convenience of these tools and they may even improve your turning. Like full-size Hamlet tools these are manufactured from M2 High Speed Steel (HSS) and they hold their edge well. In use I found that occasional honing with a diamond file was all that was required to maintain a good cutting edge, only rarely needing to visit the grinder. 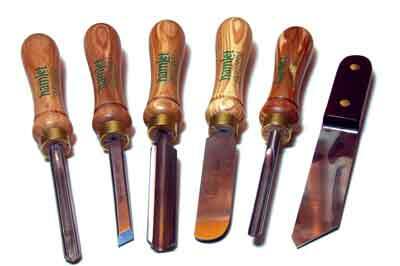 These are well designed and robust tools made from quality materials. 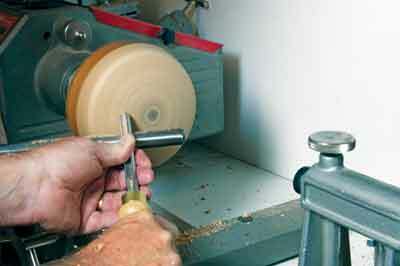 They will make an excellent partnership with any of the smaller lathes and fill an important niche gap in the market.